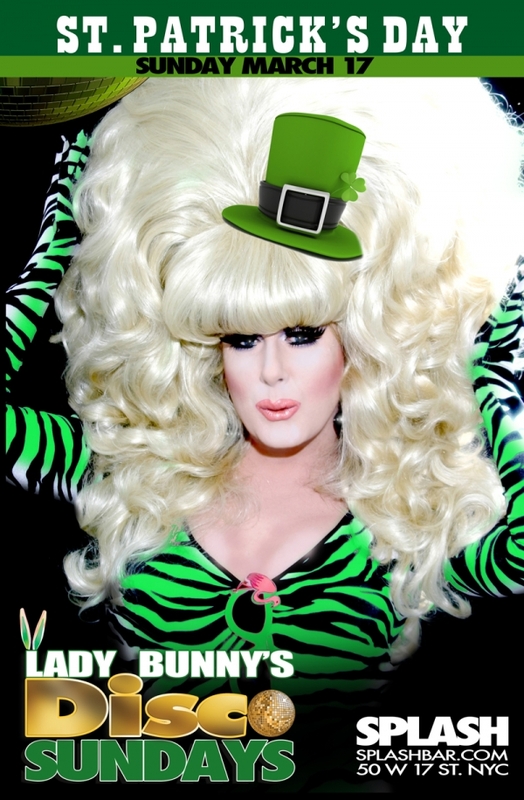 Lady Bunny Blog: SUNDAY NIGHT DISCO AT SPLASH IS BACK! Last Sunday night was the first week of my return to Splash for a weekly disco-themed tea dance. I have to play a lot of music for younger crowds which I don't care for--Ke$ha, Britney, Rihanna, Nicky Minaj, etc. So what a treat to get to spin a set of songs which deserved to be hits in the first place. No one is going to be digging up Beyonce's tired chants in 30 years, but tunes like This Time, Baby and Donna Summer's Heaven Knows still pack a dance floor. I played France Jolie's 8 minute Gonna Get Over You and marveled at the musicianship. For one whole chorus, they'd have a piano solo to take advantage of the studio musicians creating eargasm after eargasm. Nowadays, they are lucky to have enough hooks to fill 3 minutes. Gotta remember to play Patrick Henandez's Born To Be Alive. The way he pronounces "born" in the chorus has always sounded very irish to me.